More than half of female students believe gender may hold them back in their career, a study has found. 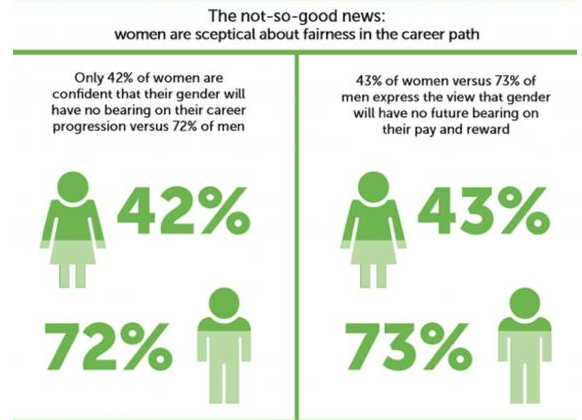 Only 42 per cent of women are confident that their gender will have no influence on their pay and their career progression, compared to more than 70 per cent of men, according to the first national Think Future Study from KPMG and the 30% Club, a group of chairs and CEOs committed to better gender balance through voluntary action. The study launched by Cambridge undergraduate Helena Eccles in November has polled over 20,000 students at 21 universities. It found that more than 70 per cent of young women are confident in their own abilities but doubtful that a traditional career path will enable them to progress their careers as far as they want. The findings also highlight the issue of “gendered” sectors, which continues to restrict talent pools in certain industries. Nearly half of female students felt that a sector’s reputation for gender equality would influence their decision about working in it. While only 27 per cent of male students considered gender equality as a requirement for working in an industry. Financial services was the 4th most popular sector choice for men and only the 12th most popular choice for women, according to Brenda Trenowden, Global Chair of the 30% Club. 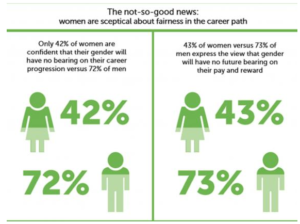 Melanie Richards, vice chairman of KPMG UK and a member of the 30% Club Steering Committee, said it is “concerning” that women are considerably less optimistic than men about their future career prospects. “As business leaders we need to play an active role to promote gender parity, bust these myths and recast the image we are projecting to attract the best talent, regardless of their gender. Within our own firm this includes setting targets to recruit, promote and bring through female talent,” Richards said. “We know better commercial performance comes from the innovation that happens between different people, and we want to recruit graduates from a wider range of backgrounds and disciplines. Having a more diverse workforce gives us a better array of viewpoints on client matters and challenge around our actions,” she added. 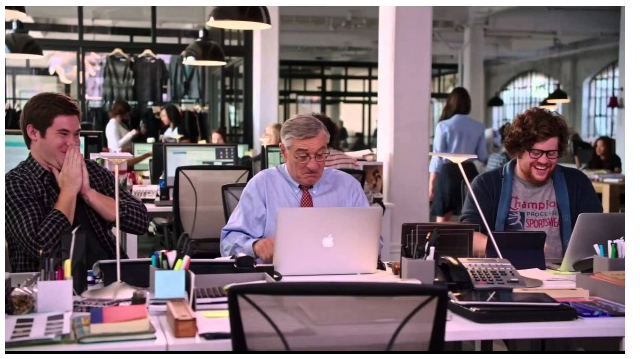 Finding a job they enjoy, having time to spend with family and friends and being intellectually fulfilled were the top three priorities for job satisfaction when it came to entering the working world for both male and female students, according to the study. Another recent study by the Equality and Human Rights Commission (EHRC) showed that headline progress in achieving a target of 25 per cent of company boards made up of women was “masking” the reality.